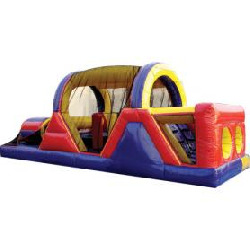 Backyard Obstacle Challenge offers 28 feet of challenge obstacle entertainment in one unit. This inflatable play structure takes participants on a journey through tunnels, around horizontal and vertical pop-ups, with climbing and descending along the way! Dimensions: 30' L x 11' W x 12' H. Please allow 34'L x 15'W space for adequate clearance.